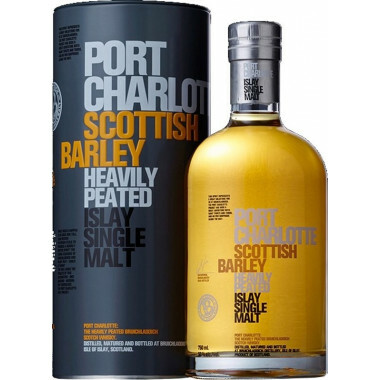 This Port Charlotte Single Malt Scottish Barley is a heavily peated whisky, that drags you into a swirl of Islay flavours and aromas with its 40ppm, mingling subtlety and smouldering peat. This version is a multi-vintage release, crafted by Master Distiller Jim McEwan who carefully selected each cask for the blending. He wanted to show that a whisky may be heavily peated and richly flavoured, with deep character, without the medicinal aspect usually associated to peaty Scotch whiskies. Using local barley from Port Charlotte Loch (lake) neighbouring village, subtle and slow distillation, pure Islay water and carefully monitored maturation in the distillery casks' allowed to craft an amazing, accomplished, slender whisky. By coupling the classic, floral elegance of Bruichladdich to the peat smoke, Jim McEwan created here a mind-blowing Single Malt, of unique complexity, where the sweetness of malted, smoky barley contrast beautifully with marine freshness. *PPM - phenols parts per million, measuring the influence of the oily smoke peat infusing the germinated barley during the drying process. The longer the exposure, the highest the ppm value is. A well peated Islay whisky reaches a 40-50 ppm. But every whisky still develops its very own character and mouthfeel sensation, depending on the style of each distillery. Port Charlotte is a whisky distillery located on the isle of Islay, which has been established by the neighbouring Bruichladdich distillery. It has been established in the buildings of the former Lochindaal distillery. Located in the heart of the Port Charlotte village, Lochindaal has been founded in 1829 by Colin Campbell. It had to close down in 1929, hit by the prohibition laws enforced in the United States. 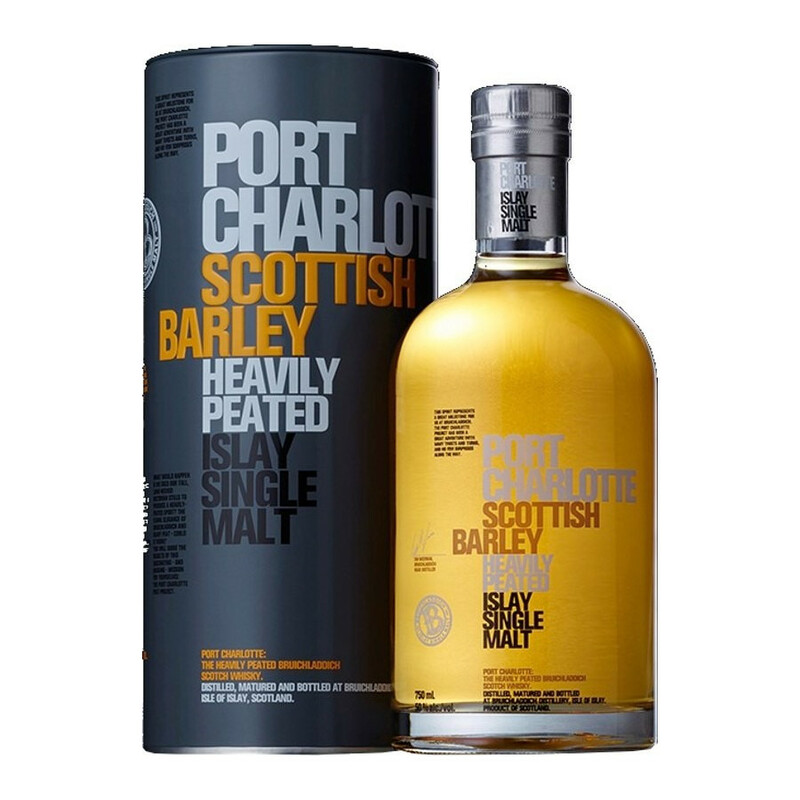 Bruichladdich announced the creation of a new distillery in 2007, and today Port Charlotte produces the peated whiskies of the Bruichladdich group, together with the Octomore editions bought back in 2012 by the Remy Cointreau group. A rare fact in Scotland, the Bruichladdich distillery (“Bruk-ladie”) uses a brewing vat in open air. Its onion-shaped stills have a very flat bottom and a long neck. During the distillation process, the alcoholic vapours rise very slowly, imparting to the whisky its elegance and refinement. Nose: opens on a powerful, smoky wave of peat with iodine scents, crushed shells, charred oak, black pepper, parika and tobacco that struck all the senses. Slowly, gives way to more subtle and complex notes of vanilla, ripe figs, sweet dates, marinated pears, freshly ground malt, caramel and pecan nuts, for a smoky, sensual overall. Palate: impressive with a warming, silky texture of peat overflowing the palate, with a grand, bursting profusion of flavours. Extremely deep and complex, the smoky barley brings sweetness and contrasts superbly with the marine freshness and caramel and vanilla richness. The whisky gains even more complexity with a touch of citrus fruits and oak. Finish: long and warm, simply everlasting.